Announcement Learn the art of needle felting and create adorable, cute and fuzzy little sculptures. These fun and easy kits are great kids 8+, tweens and adults, and for both beginner and experienced felters. Step-by-step color photographs make this craft a snap. All kits contain a generous amount of wool roving, two new felting needles and other necessary accoutrements. All you need is a foam pad and a sense of adventure. Thanks stopping by our shop. Happy felting! Learn the art of needle felting and create adorable, cute and fuzzy little sculptures. These fun and easy kits are great kids 8+, tweens and adults, and for both beginner and experienced felters. Step-by-step color photographs make this craft a snap. All kits contain a generous amount of wool roving, two new felting needles and other necessary accoutrements. All you need is a foam pad and a sense of adventure. Exactly the color I was looking for and a beautiful quality. Fast shipping, too! Excellent quality and shipped quickly. I will order from this seller again! Laurie Sharp has a passion for creating things. When she was young she opted to skip "family tv night" to make tiny things for her very tiny doll, Chrissy. As she grew older she dabbled in drawing, painting, wood sculpting, knitting, crocheting, photography and puppet making. In addition her passion for creating art, Laurie loved working with small children and became an accredited Waldorf kindergarten teacher. It was during her teacher training that she learned the fundamentals of dry felting, or needle felting, with wool. In 2001, Laurie Sharp started her own Waldorf inspired pre-school. Her curriculum included storytelling with puppet shows and she preferred to create her own puppets. Needle felting gave her the ability to create small characters and animals for story telling and she would often send a few creations home with children. Needle felting in the evening after a day's work was a pleasant and meditative escape but she worked tirelessly to refine her craft and perfect her sculptures. Eventually her pre-school parents started asking Laurie to make things for their children and encouraged her to teach them how to sculpt with wool. Laurie looked for needle felting kits to assist her learning and teaching and found there were not many instructional kits to be found. Woolpets was born in 2007 out of the passion to create and teach. Ladybugs, bumblebees, sheep, penguins and hedgehogs were Woolpets' first needle felting kits and they were developed with her husband Kevin Sharp. The first kits sold contained wool from Laurie's own sheep, Hazel and Merna who have retired to greener pastures. 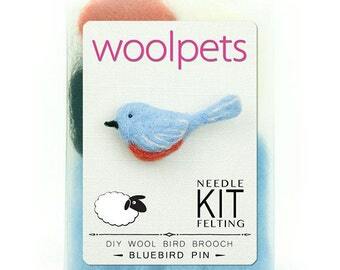 Today Woolpets has thirty one needle felting kits in their nest (and counting) and has hatched three instructional needle felting books as well: Wool Pets, Making 20 Figures with Wool Roving and a Barbed Needle (2008); Wool Toys, Step-by-Step Instructions for Needle-Felting Fun (2010) and Felted Feathered Friends, Techniques and Projects for Needle-felted Birds (2012). Woolpets strives to pass along the fundamentals of needle felting and three dimensional sculpting with wool while bringing joy to those who have a desire to create. Their step-by-step photographs and keen sense of instruction allow almost anyone to learn something new. Woolpets was founded in 2007 by Laurie and Kevin Sharp and it all started with an Etsy shop. We strive to teach the fundamentals of needle felting and three dimensional sculpting using wool with our line of needle felting kits. Welcome to Woolpets. We are glad you are here. Woolpets is a small, family run business in the Pacific Northwest. Our needle felting kits are made in the USA and we are committed to providing quality products that are assembled with care. We are also committed to keeping our customers happy so let us know how we can keep a smile on your face. 1. The buyer contacts us by email within 7 days of receiving order. 2. Item is returned to us in same condition within 14 days. 3. Buyer pays return shipping charges. Pay upon checkout via Paypal or directly with a credit card. Sales tax will be added to all Washington St. customers at the time of payment. If Paypal is giving you trouble please let us know and we can help. If you haven't completed the payment process and don't get in touch or reply to e-mails within three days your order will be canceled. Orders ship within three business days via USPS mail. All purchases include delivery confirmation. As soon as your package ships your order status will be updated on Etsy where you will also find your shipping confirmation. We want you to teach you something and make you smile. Needle felting involves a sharp, barbed needle and if you ask anyone that has ever needle felted, they will confess to poking themselves. It is going to happen. The process of jabbing a sharp needle into wool begs for the opportunity to prick your finger. Please be careful and use common sense. Our kits are intended for everyone ages 8+. They have been tested and are certified for compliance with CPSC legislation.